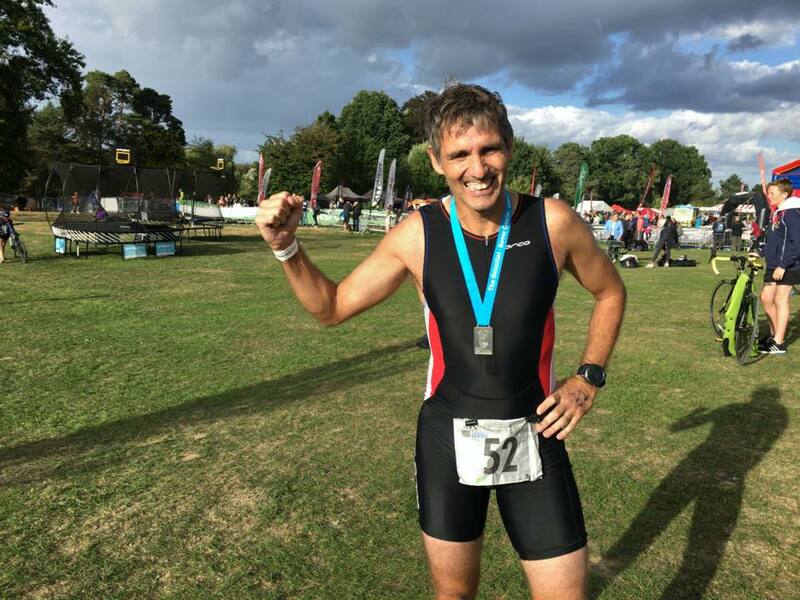 I write this race report whilst sitting in the accident and emergency department of Worthing Hospital the day after competing in The Gauntlet Half Iron Distance Triathlon at Hever Castle, part of the Castle Triathlon Series. How did I end up here? Read on Macduff. This was to be a family day out at Hever Castle, childhood home of Anne Boleyn, so we were all up and out of the house by 5:30am for the journey to Kent. 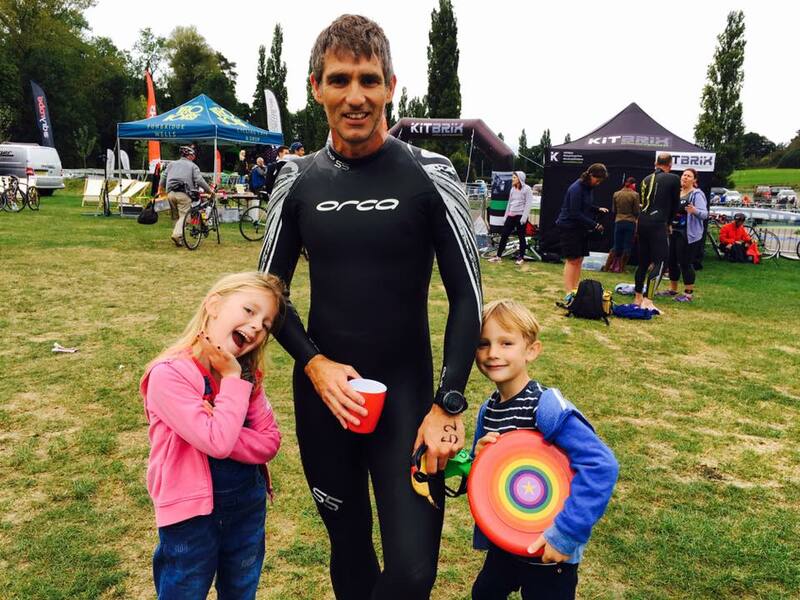 The Castle Triathlon Series event at Hever is one of the biggest in the country. There are a variety of races for adults and children over the weekend from super sprint distance and a scootathon for kids, through to the half iron distance, known as The Gauntlet. Parking was miles away from the event site and it took an age to walk from the random field in which we were parked to registration. Consequently, I didn’t have quite as long as I’d hoped to get ready. The site was huge. With over 1000 children racing as well as the adults, there were a lot of bikes racked. I had entered The Gauntlet Half Iron Distance Triathlon and my wave was the first wave off at 8am. 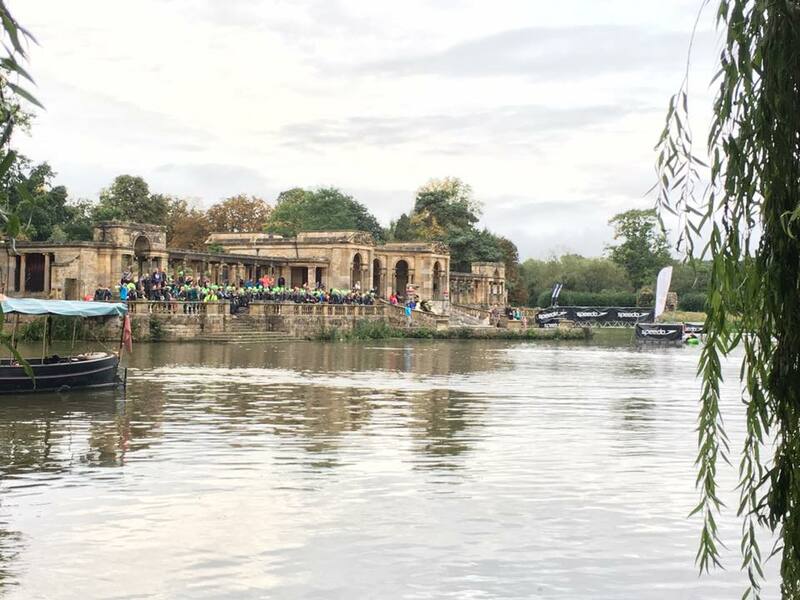 Hever Castle is a beautiful location and the 1900m Swim takes place in the man-made, navvy-built lake. As I explained in my Bastion Triathlon race report, the lake was constructed between 1904 to 1906. It was originally a field but owner William Waldorf Astor had the 38-acre lake dug out by 800 men working day and night until it was finished. There were around 380 competitors in the Gauntlet. We all made our way down to the loggia by the lake for the race briefing presented by Brian Adcock. Brian is the boss, the man in charge. Imagine a guy who has a degree in Sports Science AND Maths, who was a helicopter pilot in the Royal Marines and represented the Royal Navy at swimming, rowing and triathlon. Imagine what that guy looks like. Yes, you’re absolutely right. Now imagine how he talks….confident, articulate, humorous. Brian’s the kind of guy most guys wish they were! We were talked through the swim, bike and run routes and the British Triathlon Federation official talked about drafting, littering and the highway code. The drafting rules seem very generous. One warning followed by one blue card and timing penalty followed by ANOTHER blue card and timing penalty before eventual disqualification after a 4th time caught drafting. Race briefing delivered, I was the 4th person into the water off the pontoon, and it seemed to take an age to get everyone else in. The lake is not deep and you can put your feet down on the soft, squishy bottom. It’s a mental thing. You can either be grossed out by how it feels between your toes or you can embrace the mush. I took a few minutes to get some warm up strokes in before we lined up between two black buoys marking the start line. Ahead we could see the red 100, 200, 300, and 400m buoys, two yellows buoys making a gate and beyond that, off to the right, another red buoy. That would take us to the top of the lake. The hooter went and the chaos ensued. There are two things to think about at the very start of a triathlon swim. Don’t get kicked in the face and remember to breathe. I’ve said it plenty of times before in triathlon race reports. When you’re wearing a wetsuit, during the first 200 metres you really feel like you’re going to pass out with oxygen deprivation. A wetsuit can feel very restricting and, when you get caught in the adrenaline rush at the beginning and go off like a lunatic, you are asking for trouble. I’m getting used to this and I do try to modify my pace and settle into the swim. That said, it’s so easy to get carried away. When I’m training I breathe bilaterally and I do try to take this technique into racing, but today I found myself breathing to the left because it helped with sighting the buoys. Given that I have been putting a bit more effort into swim training recently, I wanted to finish the 1900m swim between 35 and 40 minutes, which would be good for me. At the top of the lake, we had to go round a red buoy and head across to the other side of the lake to start the river section. Half way down the river I seized up with cramp as I often do in my left calf. It took a good while for it to ease off, so when I did get out of the water my time was 43 minutes. However, the distance on my watch read 2284m. That does include some distance running back to transition, but overall, I am pretty happy with that time. Once I had found my bike in the enormous transition area, I dumped the wetsuit, donned my Salomon hydration vest, helmet, gloves and cycling shoes and ran out to the bike mount point – urm, with my bike of course. To start, there is a 400m cycle up the estate driveway before reaching the road. Once out on the public roads, I decided I could quickly down the can of Red Bull I had in one of my vest pockets. I reached in and struggled for a moment to get a grip on it. What I didn’t notice was that I was starting to head downhill. My speed increased and I only had one hand on the handlebars. A moment later I hit a minor bump in the road and the front wheel got away from me. I wobbled and lost it going pretty fast downhill. I hit the ground on my back with a mighty thump and screamed out in pain. The cyclist behind immediately stopped and shouted back for a marshal to attend. The support was really good. I lay there thinking my Gauntlet race was all over. The Hever bike course had beaten me, not once, but twice! However, although I was shocked and badly winded, amazingly my legs were fine and after a few minutes, I felt ok to carry on. I got on the bike and set off. I was so annoyed to have crashed and so early in the race too. I took it pretty steadily for the first few kilometres after the crash. I could feel where I’d landed but cycling wasn’t painful and I eventually settled into the ride. The Hever Castle bike route is one of the toughest in UK Triathlon. The Gauntlet route has 1500m of elevation over the two 45km loops. 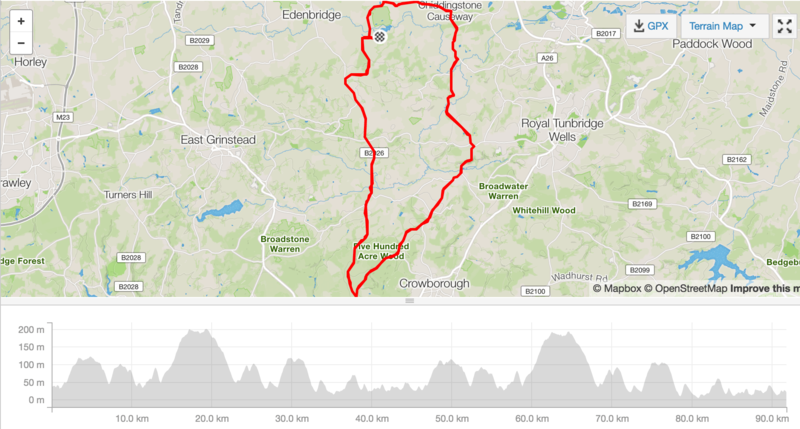 After 15km and a couple of climbs through Markbeech and Hartfield (where you would park to walk to Pooh Bridge), the route turns left and heads up the longest climb, Chuck Hatch Hill. This takes you to the top of Ashdown Forest, the highest point on the course with the most picturesque views. The Gauntlet then takes a left to head down Black Hill to Lye Green and on to Groombridge. The Bastion full distance triathlon which I attempted in July, carries on across the top of the forest. 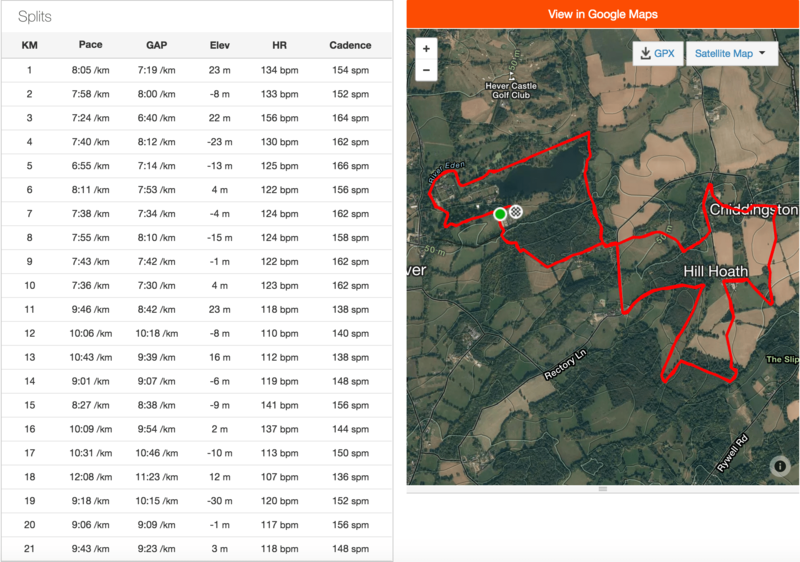 This time last year, I was running the High Weald Challenge and I remember seeing the Castle Triathlon Series competitors out on the course and telling myself I’d like to do that. This time, not once but twice, I saw three girls from my running club, Worthing Harriers, running the High Weald Half Marathon. It was great to share that mutual support as we passed each other. There’s another gruelling climb out of Groombridge and then it’s relatively straightforward back through Penshurst and Bough Beech to Hever. I completed lap one in just under 2 hours and swapped my Huel drink over with Victoria at the aid station. On the Bastion ride, I stopped at almost every aid station and must have wasted so much time. For the Gauntlet, I had water in my hydration vest bladder and Huel mixed with milk in my water bottle and didn’t stop at any of the aid stations. I did, though, have to stop twice on the second loop to put the chain back on. Annoyingly, it came off as I was changing to the smaller chain ring to climb a big hill. So I had to try and get going again and clip my shoes in going uphill, which is not easy! I was relieved when I finally made it back to Hever Castle at the end of the 90km ride. I could now relax knowing The Gauntlet Half Iron Distance was in the bag. All I had to do was do what I do every week, day in day out. Run. I can do running. I’m really not bad at it. A half marathon is a piece of cake for me. 1 hour 30 minutes on a normal day. I was planning for anything between 1:45 and 2 hours. Victoria was there cheering me on as I came back into transition. When I got to my kit, I suddenly started to feel my chest was tight. I began to feel pretty terrible, but I put this down to the usual odd feeling you get in transition between the bike and run legs. However, as I started to run, I realised I couldn’t breathe properly. I had some pain in my hip and lots of pain in my ribs. I saw Victoria again as I set out and told her “I think I’ve broken a rib”. The sun was out and it was a glorious afternoon. Everything should have been perfect for a nice easy trail half marathon, but I just couldn’t get going. My legs were fine, cardiovascular function was good, but I was in so much pain whenever I tried to inject any speed. The vertical oscillation was so jarring, all I could manage was an excruciatingly slow shuffle. I resigned myself to the fact that I was not going to get around in anything like my goal time. I hoped I might make it in 2:30. That time was still just about on as I finished the first lap. The Castle Triathlon Series is a big event and there are a huge amount of people involved. Every discipline is well marshalled by volunteers and they are clearly all instructed to make sure they cheer on and encourage competitors. I did come across one ugly incident during the run, at a road crossing when a volunteer was directing traffic. She held her hand up to stop a car and the driver shouted horrendous abuse at her. I walked up to the car and suggested to the driver, as calmly as I could, that he treat people with kindness rather than abuse. “No, f*** off, this is a public road” he shouted back at me. Nice. The run route is a 10.5km loop through some pretty countryside. At the end of the loop, you reach two big signs. One with an arrow pointing ahead, saying finish, one with an arrow pointing right saying lap two. That was a little demoralising and it’s very obvious on my Strava activity that from kilometre 11 my pace drops significantly. I walked a little with a guy called Neil who I have met at some other races. His legs had gone and he was planning to walk the rest of the way. My pain was manageable as long as I didn’t try to run fast. The slow shuffle I had adopted was getting me to the finish line and I was going to finish, no matter what. I was a bit shocked at one point when a young lad on a bike whizzed past me on the second loop. Apparently, our run route was now also a kids cycle route and there were one or two hairy moments as children raced passed shattered adults, nearly knocking them flying! I think Brian and his team may want to give the kids even more of a stern warning about safety next time. Part of the run route is outside of the castle grounds and when you eventually get back into the grounds, it really feels like you’re nearly there. There’s a really long straight section by the lake with the castle dead ahead and once you finish that it’s less than a kilometre home. I usually speed up towards the end of a race and make a big effort for the finish line. But I just couldn’t! Coming over the crest of a small hill, there were loads of supporters lining the route. I felt the emotion well up in me as it had done at Transvulcania in May. The thing is, I love it. This is what challenges are about. This is what sport should be. Taking part in something that you genuinely aren’t sure you can complete. Doing something you really don’t know whether you can finish and having the sheer bloodymindedness to get it done, or not. That emotion is the culmination of real effort and suffering to reach your goal. It’s all well and good lolling along and completing marathon here and a 50k there, but every so often it’s good to really suffer. Elsa and Ellis, my two youngest, were waiting for me at the final bend and we held hands as they ran with me to the finish. I crossed the line in 7 hours and 57 minutes and immediately asked to see the medic. I was so pleased to finish and really the time doesn’t matter at all. I’m just happy I saw it through to the end. The medic arrived and off we all went to the medical tent. They cleaned up my road rash and burns and made sure my lungs hadn’t been punctured. All ok there. 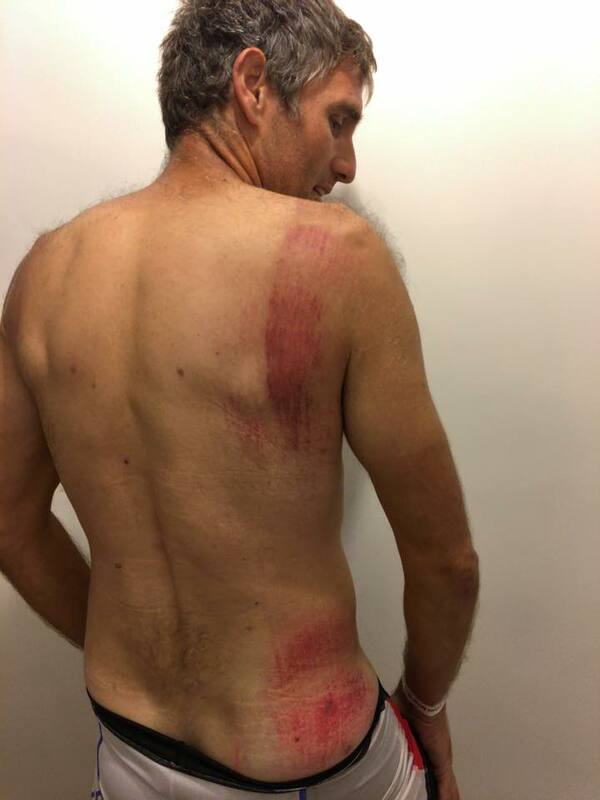 It’s either a cracked rib or just torn muscle tissue. Whatever it is it bloody hurts! Ellis, Elsa and Victoria had had a good day. They had a look round the castle which was included in the price of their spectator ticket. Elsa went on a climbing wall and Ellis won an emoji poo soft toy. Don’t ask. Elsa was thoroughly inspired to take part in a triathlon next year when she is old enough. She was blown away watching other kids, not much older than her, competing. Victoria also thought the children’s tri-suits looked cute! I am sure both Elsa and Victoria will take part in their first triathlons next year, most likely here at Hever. I didn’t take a camera with me for The Gauntlet, but the video I shot of the Bastion shows pretty much exactly the same route. 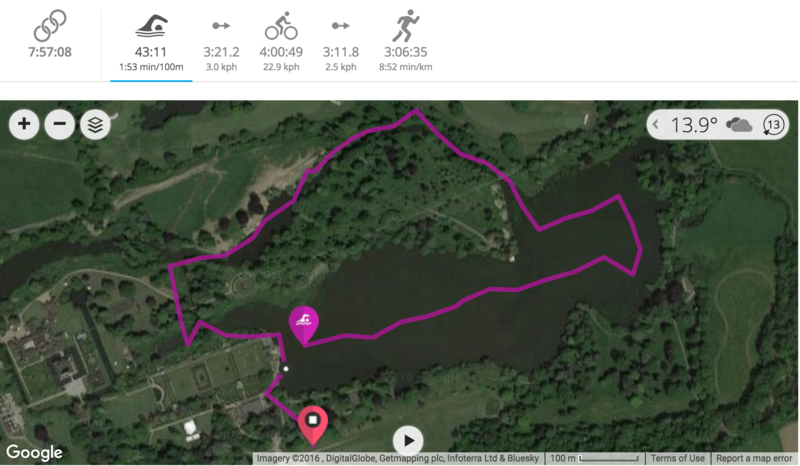 The swim is the same and the run is almost the same apart from the last few hundred metres and the Bastion bike just had an extra section added to the Gauntlet route. So do please watch that video if you’re interested. I have now raced twice at Hever Castle and both times something has gone wrong on the bike. Thankfully, this time, I finished the race, but I have a feeling I will be back here again one day to conquer the course for good. It’s a tough course, a challenging race and one certainly worth having another crack at. Huge thanks go to all the marshals and staff at the Castle Triathlon Series who do a tremendous job of making everyone feel welcome and supported, spectators and competitors alike. Particular thanks from me to the marshals and riders who stopped and helped me when I crashed. It’s such an inclusive event with lots to do for spectators. There are fairground rides for the kids and live music, plenty of stalls and places to get food, as well as the beautiful castle, gardens and lake. Not forgetting of course that this is the largest triathlon event for children in the UK. So potentially, Dad, Mum and the kids can all race over the weekend. I was 8 hours out on the course and my children did not get bored and my wife said they all had a lovely day. I highly recommend you come and do it. It’s a no-brainer. Beautiful, challenging course, great support, great organisation, lots to do for the family. What’s not to like?